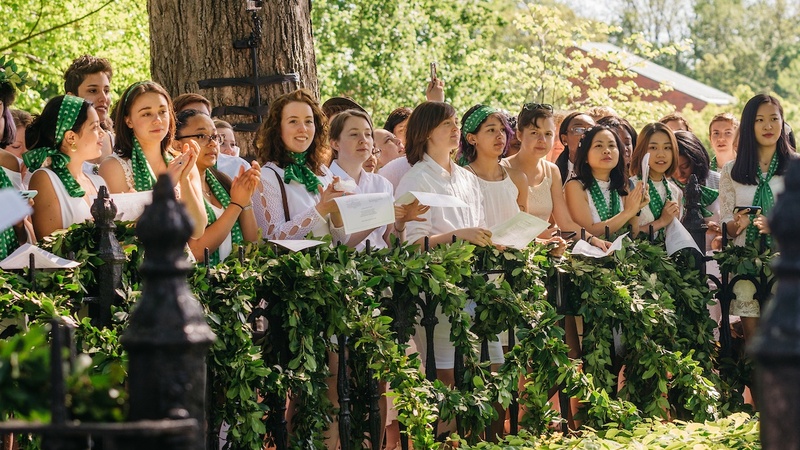 The Laurel Parade, which marks the transition from MHC student to alumna, is one of the College’s most moving rituals. 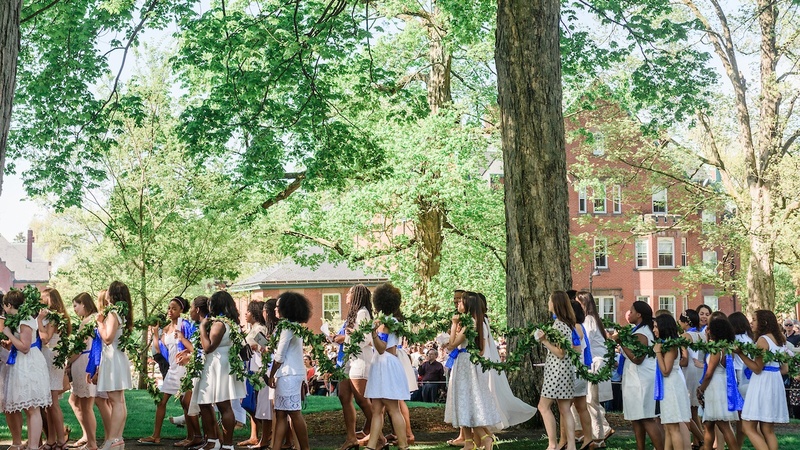 It traces back to 1900, when graduating seniors paid homage to Mount Holyoke College by placing two wreaths of laurel leaves and forget-me-nots in front of College founder Mary Lyon’s grave. They raised their voices, singing “Holyoke, Tried and True.” In 1902, garlands of laurel — laurel chains — were used in place of wreaths and flowers. And a Mount Holyoke College tradition was born. Watch the videos! 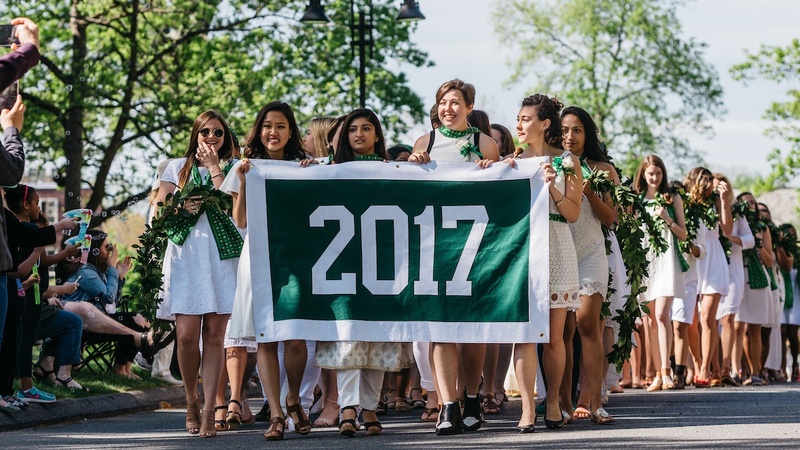 In 1932, the laurel chain tradition was integrated into the annual alumnae parade, which takes place during Commencement weekend and celebrates the alumnae returning for their reunions. Laurel Parade participants wear white, in a long-standing show of solidarity with the suffragists of the early 20th century, plus accessories in their class colors. During the parade, seniors process from Mary Woolley Hall through campus — walking four across, linked by two 275-yard laurel chains — to Mary Lyon’s grave site. All along the way, they are cheered on by family, friends, members of the Mount Holyoke community and hundreds of alumnae. Mountain laurel is a symbolic choice: It is a nod to bay laurel, a symbol of honor, achievement and glory in ancient Roman times. It also represents the unbroken linkage among all Mount Holyoke alumnae. Early on, the laurel was hand picked from the local hillsides by first-year students. Since about 1912, South Hadley’s family-owned Carey’s Flowers has assembled Mount Holyoke’s laurel chains. These days, the laurel comes from farms in western Massachusetts. The making of the laurel chains is a century-old tradition — watch the video. As seniors encircle Lyon’s grave enclosure, they pass the laurel chain overhead, draping it on the iron fence. The ceremony concludes as students and alumnae join together in singing “Bread and Roses,” a poem-turned-song that was taken up by strikers demanding reasonable hours and equal pay at a textile mill in Lawrence, Massachusetts, in 1912. 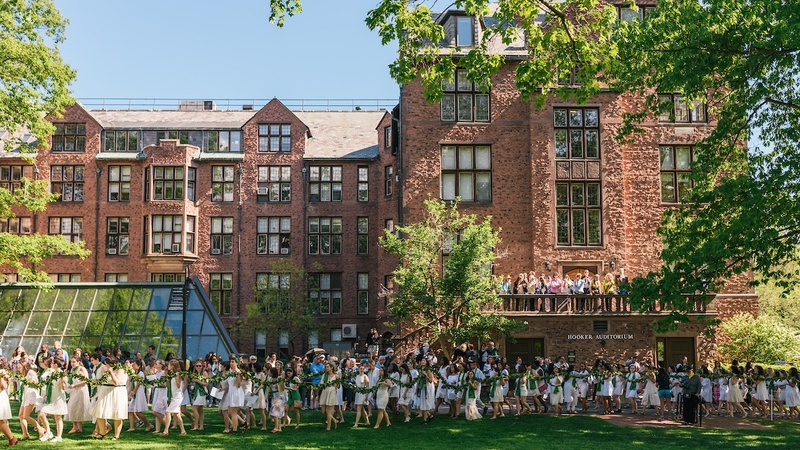 And through this tribute to women’s courage and achievements in history, and to the unbroken connections between generations of Mount Holyoke graduates, the newest generation of alumnae are launched into the world. Watch an aerial video of the Laurel Parade, in all its glory! Join a spirited tradition of excellence.